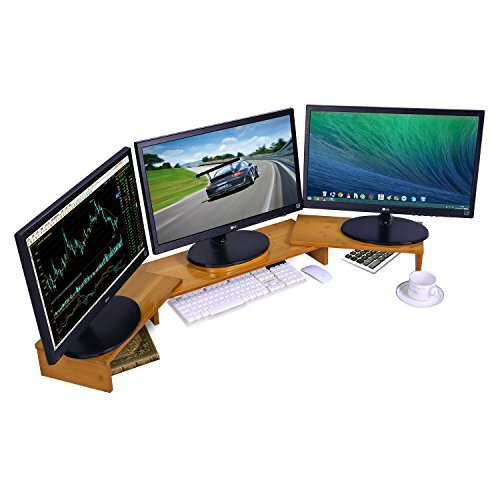 Bamboo Monitor Stand Riser,with ergonomic height, helps relieve your cervical fatigue. It is suitable for special people such as those working at TV stations, video image editors, stockbrokers and decision makers in the company.Monitor stand adjustable can help expand the vision field, compare the browsed files and provide convenience for mutual copy.The video editors, industrial designers, graphic designer and other designers will have a greater editing space and achieve the synchronization of real-time preview of modification and effects with it. It can greatly improve their work efficiency, free up more office space for them and beautify their office environment. -Please make sure all the holes are aligned before 100% tighten the screws. -Please wipe the bamboo wood surface when use at the first time.